I asked Price what kind of cake he wanted for his birthday and he picked German’s Chocolate Cake. That is his favorite, so it is time that I make it for him! Did you know that this cake isn’t a German recipe? Nope, it’s not!! The name is from the creator of the chocolate that is used in the cake. In 1852, Samuel German developed the chocolate and the brand, Baked Chocolate Company, named it after him, Baker’s German’s Sweet Chocolate. Then the recipe was then created in 1957 by Mrs Greorge Clay in Dallas, Texas. Once Baker’s heard about the popularity of the recipe, they spread it nationwide, making it a beloved cake recipe today. I have used the original cake recipe that Mrs. George Clay shared in the past but I much more prefer to use the recipe for the Bakers’s German Sweet Chocolate Cupcakes and instead of using the cupcake pans, I used three 9″ round pans. I layered the frosting in the middle of the layers and loved how it turned out. Taste and looks… perfect! I mainly used the cupcake recipe because the original cake recipe is a bit more complicated with having to separate eggs and beating the egg whites until they had soft peaks to fold them in… blah blah blah. I am kinda lazy and didn’t want to deal with extra dishes. Plus, I liked how the cupcake recipe used buttermilk, and I love recipes with buttermilk. I just love the flavor it gives things, especially baked good. So I figured I’d give it a try and see how it came out with the slight adaptation in pans… perfect! The cake was very soft in texture so it didn’t sit too evenly once layered, like it wasn’t too sound structurally. The other recipe is probably denser. I will have to give it a try one day. 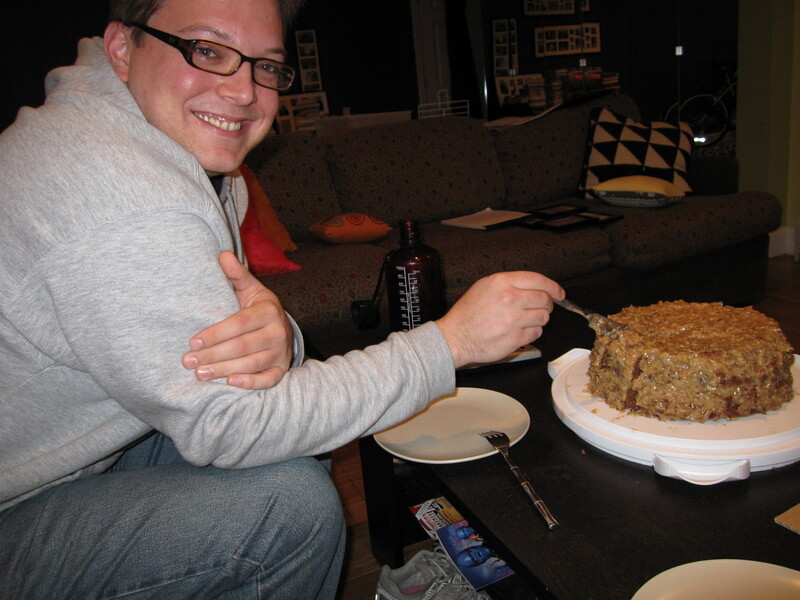 While the cake itself is great, the best part is that coconut and pecan frosting. It’s crazy delicious. Price suggests that you enjoy some cake with a scoop of ice cream. His preference is coffee ice cream. Be sure to give that a try! Preheat oven to 350°F. Cover bottoms of 3 (9-inch) round cake pans with parchment paper; grease sides of pans. In a microwave safe bowl, microwave chocolate and butter in 50% heat 2 minutes. Stir and continue to microwave and stir every 30 seconds , until chocolate is completely melted. Combine the flour, baking soda and salt; set aside. Transfer the melted chocolate to a bowl of a stand mixer, or very large bowl if using a hand mixer. Add the sugar and beat well. Add the eggs, 1 at a time, mixing well after each addition. Add the vanilla. Scrape down the sides of the bowl well. Add half the flour mixture, mix well. Add the buttermilk, mix well, and then the rest of the flour mixture. Evenly pour into prepared pans. Bake for 25-33 minutes or until toothpick inserted in centers comes out clean. During the baking process, rotate the pans. Immediately run a small metal spatula around cake layers in pans. Cool in pans 15 minutes; remove layers from pans to wire racks. Remove and discard the parchment paper. While the cake layers are cooling, make the frosting. In a large saucepan, combine the egg yolks, evaporated milk, and vanilla; mix with a whisk. Add the sugar and butter; turn on the heat to medium and continuously mix while it cooks for 12-15 minutes, until thickened and golden brown. Remove from heat. Add the coconut and pecans; mix well. Cool to room temperature. Once the cake layers and the frosting has cooled, spread 1/3 of the frosting on the first layer of the cake, top with the next layer, another layer of frosting. Finally top with the final layer of cake and the remaining frosting. The coconut frosting look amazing. holy cow, my mouth is literally watering.